Today, I made a very disappointing discovery when I tried to answer a query from a member of Google Blogger Help group. I always moderate comments via email, and have been receiving notifications regularly. When I moderate comments via email, I have the advantage of having a link to the post in which the comment was made, so I can easily respond to the comment if needed. There are 3 choices in the email notifications - Publish, Reject, Moderate. I have practically click on the Publish link all the time, and only occasionally click on Reject. I have never tried clicking on Moderate. The question was, is it possible to edit comments? I though it might be possible by clicking on Moderate, and I said I will test it. I checked for comments to moderate, and it so happened that the only email notification for comment moderation was for my beta blog. I clicked on Moderate, and to my surprise, I was taken to a page with a long list of comments waiting to be moderated, with the one in the email right at the top of the list. I never receive any email notification for those comments below the first one in the list. This means not all comments will cause an email to be sent to me for moderation. Update 2 Febuary 2008: I have been feeding Blogger with details of this problems for a long time and the problem still persists. In the POSTING tab, you will see a sub-tab "Moderate comments". I clicked on "Moderate comments" and found a list of 51 comments waiting to be moderated dating back to July if I remember correctly. I never realise this as I had been receiving email notifications regularly, and never knew that for some comments, no email notification were sent. It was a lot of work checking the comment one by one and publishing them. Worst, I wouldn't have time to check through all my post to respond to them. So if your comment was late in getting approved, and didn't get a response, please forgive me. Blame Blogger. I have notified Blogger support about the problem, and have also made a suggestion that they make it possible to navigate to the post where the comment was made when you moderate comments from the Dashboard. I hope the bug get fixed quickly, and that my suggestion will be acted upon. In the meantime, my advice for those moderating comments via email, do log into the Dashboard and try moderating comments from there. You may find some comments waiting for you to moderate without you knowing about it. You can actually get the title of the post where the comment was made by clicking Post Name. However, this disappear after you have approved the post, and you have to have sharp memory or you have to write it down somewhere if you don't want to lose the ability get to the post to respond to it. In any case, I much prefer modearating from email as there will be a direct link to the post to enable one to respond to the comment. Most Blogger bloggers will already know this, but someone asked, and I thought I might as well answer it in a post. Further, I followed the usual way, and failed. So I think it would be good to make a post, plus description of what to do if that failed. To delete a comment, first make sure you are signed into your Blogger account. Then go to that post and in that comment you want to delete, at the bottom you will see a trashcan icon. Just click on the icon and confirm that you want the icon to be deleted and it will be done. "Thanks for writing in. If you're unable to see the trash icons for comments on the post page, you can go to the posts' comment page instead. There, you should be able to find the trash icons. I apologize for the inconvenience." I (already logged into Blogger) click the month in which the post appeared in the Archives in the sidebar and was taken to a page with all the posts of that month including the post in which I want a comment deleted. I then click on "Comments" at the bottom of the post and got to the post's comment page. There, I finally saw the trashcan icon, click on it, confirmed, and the comment was deleted. Footnote. The reason why I needed to delete that comment was the person posted a long unbroken line (unclickable link) which caused the sidebar in that individual post page to slide to the bottom of the page in IE. I didn't realise this for a long time as I normally used FireFox (close new window to come back to this page). My recommendation to every blogger is to frequently check your blog in IE for problems like this if you normally use other browsers for your surfing. Irfanview is a very good free image editor which can be very useful for bloggers working with images. I used it very frequently especially to edit and upload screenshots to my posts. You can get Irfanview by googling for "download irfanview". What and how do I use Irfanview for my blogs? Well, very frequently, I need screenshots to better explain what I want I have in mind. (I refer to screenshots below because I mainly work with screenshots. The same methods apply to photos, etc.) To do that, in the particular page, I press the key Printscreen, open Irfanview, click Edit in the menu bar and choose Paste, and the screen image appear in its editor window. With this method, the cursor will not be displayed. If I want the mouse cursor to be shown on a particular spot to draw attention to it, I first go to the screen I want pasted, go to Irfanview, press C, and a pop-up will appear. I select the relevant options, make sure "Include mouse cursor" is ticked, click start and I will be taken to the previous screen. I then press ctrl+F11 (the key is configurable, but F11 is the default. It can be changed but I have no reason to change it), and I will be taken back to Irfanview with the screen in the image editor window with the mouse cursor in the spot where I last left it. If I want only a particular section of the screen of the screen to be included, I drag and drop the mouse in that section. a broken-line box will surround the section. I click on Edit in the menu bar and select "Crop selection" and the rest of the screen will disappear, leaving only the section. I then save the file, usually in jpg format (there is a huge selection of formats to choose from in Irfanview). I then upload the screenshot into the post. If I want text to be displayed in certain section of the screnshot, I drag and release to highlight that section of the screenshot I want the text to be displayed, click Edit in the menu bar, select "Insert text into selection", a pop-up will appear with a box for me to type in the text. There will be other options such as choose font, alignment left, center or right, etc. When I am finished, I just click OK and the text will appear in the screenshot. When I want to draw attention to certain section of the screen, such as putting a circle or a rectangle around a section of the screenshot, it unfortunately can't be done in Irfanview. I first save the file. I then open Paint available in the Accessories section of Windows. I open the file in Paint. I first select the color of the ellipse I want it to be, usually red by clicking on the square of color in the palette at the bottom of Paint. Then I select the icon for ellipse in the toolbar on the left side of Paint. I then drag and drop the mouse over the section I want to highlight, and an ellipse will surround that section. To see an example of a screenshot with a portion of it highlighted by a red ellipse, surf over to Generating simple graphic header using Irfanview photo editor (click "BACK" button to return to this page). If I am not happy, I click Edit in the menu bar and select Undo, and the ellipse will disappear. I repeat again until I am satisfied. I then save the file (the default format in Paint is bmp. I normally change it to jpg). The screenshot is then ready for upload to the post. 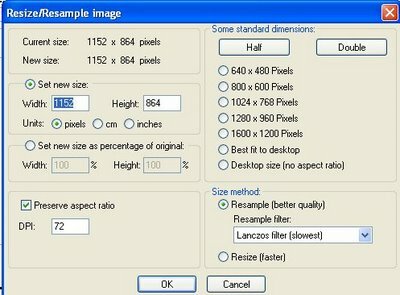 If, for example, you want to resize the image so that the width do not exceed the width of the column, enter the pixels into "width", leave the "height" alone and tick "Preserve aspect ratio". The height will be automatically set to keep the image from being distorted. You can then either save the image to be uploade in its original size or just use the figures in the width="" height="" attributes in the <img> tag. (Note: if you are using the <img> tag, you only need to enter the attribute width="X". If the height attribute is left out, the resulting image will automatically be scaled so as to keep the aspect ratio constant). The ico format will be useful if you intend to add a Favicon for your blog. Generating a simple graphic header using the Irfanview photo editor (click "BACK" button to return to this page). (close new window to get back to this page). Among many recommendations is to strengthen your password. I have since done that. Fortunately I have a way of creating long password with numbers mixed. I would like to disclose the method I use, but that would be exposing myself, so you will have to find your own way. The only thing I feel safe talking about is it consist of 3 parts which are easy for me to remember. Also, I am mullti-lingual. Hope these hints helps you. The only drawback is the hassel of remembering long password (which in my case is not difficult) and to have to type in long password. I have changed the gmail account password as well as the Google account password (I thought they share the same password, but they don't) for my beta blog. If you want further information about creating strong passwords, have a look at this article: Strong passwords: How to create and use them (close new window to return to this page). Another site on creating hard to guess password: Choosing good password (close new window to get back to this page). Another safe surfing tactic you may want to use is to install 2 or more user accounts for Windows, one with administrative rights which you use only when you need to install software, and the other non-administrative for general surfing. For me, unfortunately, I have a habit of having 3 browsers opened simultaneosly, and I have not figured out the way to install Opera such that it is also accessable for non-administrator users, so I am sort of forced to use the administrator account most of the time. When I find out how to install Opera for all users, I will begin to follow my own advice. Sign into blogger.com (Dashboard). On the top left, under EDIT PROFILE, click "Accounts". In the next page, there will be a long list of Google services, which all uses the Google account. Click "change password". Type in your current password. Below, there will be 2 boxes to type in the new password. They must match. Note: This will change the password to all Google account related services such as Gmail, Google analytics, etc., but not your Google AdSense account. To protect your hardwork and prevent headaches, do read Chuck's articles: The real Blogger Status (close new window to get back to this page). Update 29 November 2006: Looks like having Norton Securities and strenthening my password from 10 characters to 15 didn't help. My Blogger account was hijacked and all (except one of which I am only a team member wasn't listed in my Dashboard, and all the blogs were redirected, for me to google.com.my, for others to other sites. Do read Chuck's articles if you want to protect yourself. Meanwhile, Chuck is trying to figure out how the hijack happened. Blogger employee helped to restore access to 2 of my blogs. It must have something to do with the template as changing the template removed the redirects. How the bad guys got into Blogger's templates we still can't figure out. Clicking the link in the previous post should lead to the section "This is where it should land" if the method works (but as I have said earlier, I have serious doubts). Well, as expected, it did not work. Note: You should be on the individual post page (permalink) and not the main page (you get to the individual post page by clicking on the timestamp at the bottom of the post alternatively called permalink, or by clicking on the title of the post in the Previous Posts in the sidebar). If both pages happen to be in the same page, like if you happen to be in the main page, then clicking on the link will take you to the target but is not testing what we are supposed to be testing, which is to take on to a specific spot on a DIFFERENT page. Let's see if it works. Well, I couldn't test because the code I put in the post was not accepted by Blogger. So this will have to wait for another time. NOTE: This post is not complete and is still being updated. I got some new information and testing it out but faced some problem. Still investigating. Update: The method to link from a particular spot of one page to another particular spot in a DIFFERENT page is given here: How to link from one spot on a page to a particular spot in a different page. I doubt it will work, but I have to try anyway to make sure the rebuttal I intend to make to someone attacking me on a forum is accurate. (see thread hyperlink to a specific spot in another document (close new window to get back to this page). I am trying to see if the method How to enable your visitors to jump from one part of your post to another (Click "Back" button to get back to this page) to make a link jump to a specific word in the same page will also work for jumping to word in another page. So I am going to see if a clicking a link on this page can cause the reader to jump to a specific word on another page. The way I am going to test it is to go to the individual page (permalink) of this post, click on the link, and see if it will help me jump to a specific word on that post. Here is the link: A word in a another post. If it leads you to another post with the word "This is where it should land", then the method described will work for jumping to a specific word in another page, but I really have serious doubts, but I have to try anyway. Update: Well, I tried. I have made the target in the next post where clicking on the above link should lead to, but nothing happens when I clicked it. This confirmed what I had said in the previos post, that the method wouldn't work for jumping to a specific word in another page. Trying another method. This link should lead you to a spot in another page (next post) "This is where it should land. I am always in the process of learning and trying things out, so let's hope for my reader's sake, it works. (Note: for some reason or other, the HTML for the link is not accepted because Blogger is giving the error message "Your HTML cannot be accepted: Tag is broken:" even though when I ask those who should know says the HTML is OK. Will try another time when I have the time and the information). Sometimes bloggers may want to make it easier to navigate to a particular section of their page by clicking on a link rather than scrolling around the page to look for it. For this, you will have to use the target attribute and the name attribute. For example, you want your visitor when they click the link evolution to be led to a section "Evolution". Then what you should do is to first put a target attribute at the section "Evolution" somewhere on that same page. <a name="evolution">lt;/a>Evolution or any text, it doesn't matter. I really wish I have more text to demonstrate better, but there are just too many files in my "to do" folder. However, I think what I did above is enough to illustrate and explain further how to do it. If any reader find any difficulties, do comment in the comments section, and if I have the time, I will do something about it. I have also encountered this problem in other browsers, however, I have noticed the problem occur most frequently in the Opera browser. A reader of my blog Blogger Tips and Tricks contacted me with the same problem and I have adviced her to change browser and/or clear private data (cache, cookies). She reported back that it helped her solve her problem. Another member of the Blogger Help Forum also complained of the same problem and I have given the same advice and that too has helped her. Others have said that doing a refresh will help. Blogger Employee has indicated that it will only be a matter of months when all blogs will have to be migrated to Blogger Beta irrespective of whether they want to or not. From the posts in Blogger Help, it looks like there are quite a number of bugs that need to be ironed out. Even those bugs reported to be solved seem to be still a problem. For example, beta blogger being unable to commenting on blogger classic blogs, and vice versa have been reported to have been solved. I have tested that and have found positive results: Testing non-Beta bloggers commenting on Blogger beta blogs and vice versa. (close new window to get back to this page). However, a reader of my blog complained that he (blogger beta) failed to comment on blogger classic blogs and he is FEDUP. I have read posts complaining of the same thing, and I am forced to do an update to my post. Blogger beta have "Newer Post", "Home", "Older Post" at the bottom of their individual post page (permalink) at the bottom of the page. However, I have a work-around to add that to my Blogger classic blog too. See post How to have "Previous" and "Next" links at the bottom of your Blogger blog. (click "back" button to get back to this page). That post uses table, and actually uses "Newer Post" and "Older Post" and also does not have "Home", and someone commented that he doesnt like table. If I have the time, I will redo that post or do a new post and redo all the "Newer Post" "Older Post" without using table, and also include "Home" for this blog if I have the time. I think I can live without their Layout too. I believe reverting back to classic template will enable me to continue doing the things I am used to if I find that what I want to do can't be done in the beta template. UPDATE: Read a post where someone who have 2 classic blogs (completely different) with different identities got the 2 blogs merged into one when migrated. So if you have 2 blogs you want to keep them separate (I have some environmental blogs and some blogs about blogging, and I have separate profile for them), do make sure they have different gmail or Google accounts, or make sure that any email addresses associated with them are not similar gmail addresses. Many Webmasters and bloggers think that in order not to lose visitors, they should make links open in new windows. Others are of the opinion that it is a bad practice as it will discourage visitors from visiting your site again. So I did a sort of a poll (using comments) to find out if people are put off by sites having links open in new windows. See Poll - does making links open in new windows piss you off? (click back button to get back to this page). The majority of those who responded says no. However, it may not be a representative sample as those who responded I assume are all bloggers themself, and may not represent the general population. Also, one said that he prefer links to open in new windows if they lead to other sites, and in the same window if it is on the same site. After the result of the poll, I have decided to continue my practice of making links open in new windows, but add a comment after the link (close new window to get back to this page), and when I make a link to the same site, add a comment (click back button to get back to this page). I hope that will help, and also prevent confusion such as visitors having got used to links opening in new windows closing the window when they click a link leading to the same site (which open in the same window). I hope very much you will leave your comments on what you think of this practice. It will be good for you to know too, as that can influence you on what practice to follow by knowing what other thinks. Well, I published it, and checked in Internet Explorer, FireFox and Opera, and in all 3 cases, the sidebar stayed where it is supposed to be - at the top of the page. So, if you ever want to put a large image in your blog without the problem of sidebar sliding to the bottom of the page, put it in a scroll box. To get HTML for the scroll box, go to How to make a scrollable box. Update: Rose commented that a better idea is to post a thumbnail so that visitors can click on the thumnail and go to another page to view the photo (see comments section). There are normally more than one way to solve a problem, and mine is one and Rose is another. But I think a better idea than posting a thumbnail is uploading the large photo via the normal Blogger way which will place something bigger than a thumbnail but which will be reduced in size by Blogger to fit the column, and visitors still have the option to click on the image to view the larger image. I normally include a message to click on screenshot (most images I post are screenshots) to enlarge. Update 8 February 2007: See post Testing using New Blogger (formerly beta) for hosting photos for the profile, sidebar, etc. This post is a result of analysing traffic to my site with statcounter (Something you should do. To see how to install statcounter to your blog, read post How do I track visitors to my blog. For those using Blogger Beta, look at Adding advertisenent, hit counter, etc to Blogger Beta blog). I saw people searching for terms like "adding photo to profile" being directed to wrong pages, so I though it will be a good idea to publish a post specially for that. Should be helpful for those who do not know how to do it. In Blogger, to add a photo to your profile, first you have to host your photo somewhere. The photo must be less than 50k. It can be with an external photo hosting site like Photobucket, or with Blogger itself. However, with Blogger, you can't upload the photo the way you do it with posts. See this post on the way to do it: Getting Blogger to host your Profile photo, etc. (this post was prepared before New Blogger (formerly Blogger Beta) was introduced. Now you will have to refer to Getting New Blogger to host photos for your profile, sidebar, Header, etc.). Then you must get the URL of the photo. Click SAVE PROFILE and republish whole index. Note: Some have complained that Blogger wouldn't accept their photo URL because it is too long when they use Blogger to host their profile photo. I have suggested using tinyurl to convert their long URL to a short one, but they have reported back that it doesn't work. The alternative then is to try to use a very short title when you save the photo into your computer and see if that helps. Alternative is to use external photo host like photobucket. Update: This post was written before New Blogger was introduced. Now with New Blogger, you can have photo URL of up to a maximum of 256 characters. See Testing uploading of photo to the profile for the New Blogger. To add screenshots to your post is very easy. All you need is a suitable image editor. The ones I use are Paint and Irfanview. Paint is available by clicking START > PROGRAMS > ACCESSORIES > PAINT on the taskbar at the bottom of the page. Get to the page which for which you want the screenshot to add to your post and click the PRINTSCREEN key. Then go to PAINT program. and click EDIT > PASTE at the menu bar at the top of the page. You will see the former screen in the image editor window. Here you can do various things like rotate or resize (stretch) your image, add text, put a circle or box round the thing you want highlighted, etc. For example of a part of the screenshot highlighted, look at the screenshot in this post: How to put images in sidebar. The very important feature missing from Paint is allowing cropping of the image when you want only part of the image to display. For that you should get the very good and free Irfanview. To download and install the program, just do a search "download irfanview" and you will get a choice of many download sites. 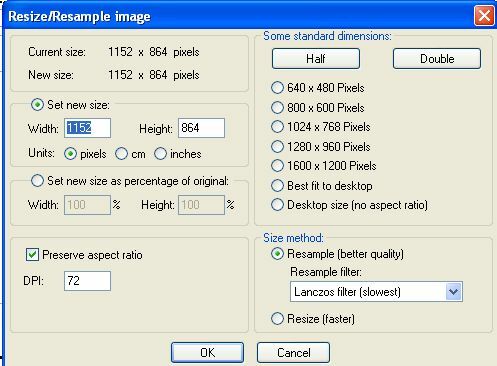 With Irfanview you can crop your image, resize your image more accurately using pixels (Paint uses percent), make your cursor display (for this, you cannot use Printscreen. Go to the page for which you want the screenshot, go to Irfanview, press the key C, then in the pop-up, click START. This will bring you back to the previous screen, place the mouse in the position where you want the cursor to be displayed, press ctrl+F11 and the image editor window in Irfanview will be filled with the screen with the cursor showing. For example, look at this one of the screenshot in this post: Uploading and manipulating photos with Blogger (and Blogger Beta). This post will also help you to manage your screenshot for uploading. When you have the image ready, save into your computer and then follow the instruction in the post Uploading and manipulating images in Blogger (and Blogger Beta). Well, as you can see, the test is successful, the images put into a scroll box is scrollable. There are 3 photos in the scroll box. You can scroll down to see them. 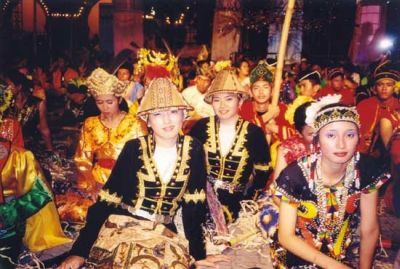 BTW, the images you see in the scroll box are photos of dancers in a very colorful event called Citrawarna (The Colors of Malaysia)held in Kuala Lumpur, Malaysia every year. It will showcase a kaleidoscope of arts, culture and tradition of the multi-racial nation. It will be a grand parade with thousands of dancers from all over Malaysia performing. Since 2007 will be Visit Malaysia Year, I would expect next year's Citrawarna will be held in a very big way. Citrawarna Malaysia is expected to be held in July 7, 2007. Many events will be organised for the tourist and 2007 will be a good year to plan for a visit to Malaysia. A reader of my blog Testing Blogger Beta asked how to make scrollable box or scroll down box (or scroll box, I don't know what exactly to call it). To see what I mean by scrollable box, surf over to this post: Testing adding of Google AdSense search box in Blogger Beta. There are some scroll boxes there in which I had to put some HTML codes, which if done any other way, will cause the sidebar to slide the bottom of the page because it is too wide for the main column width. Type or paste whatever text or HTML you want in the place where you see "Put your stuff here" (and of course then delete "Put your stuff here" and publish your post). Note: The width and the height of the box can be changed by changing the numbers in height:300px; width:400px". Note also that there is a large space above the first line of the text. I don't know what is causing this, and am trying to find a solution to it. When I do, I will put an update or redo the post. The trouble is, I am trying to do so many things at the same time. If this is troubling you, do remind me. The reader also ask if that will work for pictures. That is an interesting question. I will have to test it. (This has been done. See post Testing if scroll box works for images. (Click the "back" button to get back to this page). UPDATE: A reader of this post has commented and given a link to a scroll box generator. For that generator, you will have to enter variables like width of box (important), height, font size, color, etc. I have tried it and it works. But haven't had the time to test it more thoroughly. The generator is at this site: Scrollbox Generator. (Close the new window to get back to this page). The tip is given by Luigi who have made a scroll box here: Trovamiunnome (close new window to get back to this page). copy from the file, paste it into the post editor, adjust the width: 395px; height: 100px; to suit the occasion and paste the codes I want to display just before the last </div> tag. To merge multiple blogs in multiple account into one Blogger account, do the following. Since this post is motivated by someone who have multiple (I assume 3 or more) I will be writing this with the assumption that you do have 3 or more multiple accounts, but if you have only 2 accounts, I think it is no problem after reading the post how to adjust for that. Update: Some bloggers who have successfully merged blogs in multiple accounts into one has also deleted their excess Google Account. Please note that images uploaded via the deleted Google account will no longer be displayed. Advice is to never delete any Google account even if you no longer have any use for it. Before doing that, a piece of advice. If you are using only Internet Explorer, get FireFox, a much better browser than IE. Refer to What is FireFox and why you should be using it. It is a big advantage to have more than one browser on your computer. Read about the advantages of this in Why you should be using more than one browsers. All this will also make your following task easier. You may also want to add Opera. (You can do it with only one browser, but you will have to keep logging in and logging out). In one browser, say, Internet Explorer, sign into your Blogger account which you want the blog transferred. Select the relevant blog. Click SETTINGS > MEMBERS. Click "Add Team Member(s). Then under New User(s), add the email of your other account in which you want to make your main Blogger account. Open another browser, say FireFox, sign into your other Blogger account. Click on the blog. Click SETTINGS > MEMBERS. Click "Add Team Member(s)". Do the same thing as above. Open one more browser, say Opera. Sign into the email with which you have registered with the main Blogger account. Check for the email invitations. Accept the invitations. Go back to your previous browsers and get back into the Blogger account. Get into your MEMBERS setting. Make sure that your main account have been added as a team member. Give the the main account (yourself) administrative rights. Do the same for the other Blogger account in which you have added your main account as a team member. (In this case where I have assumed you have 3 accounts, it means going to the other browser). Now that you have given the main Blogger account administrative rights, Go back to the browser in which you have signed into the email for the main account. Sign into your intended main Blogger account. Check your blogs, and make sure that the blogs have been added. Select the blogs, click SETTINGS > MEMBERS and make VERY SURE that you do have administrative rights. Then if you wish, you can remove the other team members (Blogger accounts). Now you have all your 3 blogs in one Blogger account. Adjust the method according to the number of Blogger accounts and blogs that you have. UPDATE: Before you try to use this method, read the comments section first. UPDATE 13 November 2006: There is one more comment that says the original owner of the account cannot be removed, even if the new team member is given administrator works. Since I have limited time and may take some time to test it myself, please read the rest of the post with a pinch of salt. It may not work. Bloggers frequently have more than one blogs. If the blogs are all in the same Blogger account, all of them will have the same profile. If you want to have different profiles for different blogs, this is what you must do. It would help if you have more than one browser otherwise, you will have to log in, log out, log in, etc. This will be especially true for those using Blogger Beta. 1. Start a new Blogger Account with a different email address from your original account. 3. In the new browser, sign into your original Blogger account (Dashboard). 4. Select the blog you want to be in the new account. 6. Click "Add Team Member/s"
7. Enter the email address that you used for the new Blogger Account in the New User(s). 9. Look for the invitation. Accept the invitation. 10. Go back to the browser where you have the original Blogger account and the blog in which you want to be in the new account. In the MEMBERS setting, you should see a new member. Make him an administrator (be very sure of doing this). 11. Go back to the first browser and get into your new Blogger account and confirm that the blog is in your Dashboard. 12. Now that you are sure things have worked out, in your original Blogger account and the relevant blog, in the MEMBERS setting, remove yourself as a member. Now you should have 2 blogs in two different Blogger account and you can set different profiles for the 2 blogs. And if you are using 2 different browsers, you can be logged into both at the same time. Update: I have written this post solely from logic and from I know of how Blogger works. But I never had to try to change the profiles for my different blogs myself. A reader commented that he followed the instructions, but found that while he now have 2 users on both blogs as administrators, he could not remove the original user from the secondary blog because the remove option isn't available (see the comments section). If I have the time, I would test that out and report it here. In the meantime, if you have tried to make different profiles for your different blogs and found the same difficulties, I hope you will put your comment there. You may have some issues with a person. For example, he may be posting unwanted comments on your blog, or you may just don't want him/her to see your blog. Go to Toolator: IP address blocker and you can fill in up to 3 IP addresses of persons you want to ban and redirect either to a default site given by Toolshell or put in the URL of the site you want the banned person to be redirected tool. 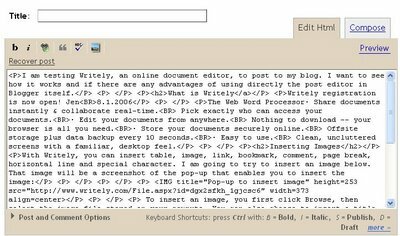 Then all you have to do is to click a button to generate a code to add to the template of your blog. This will place a button on your blog. 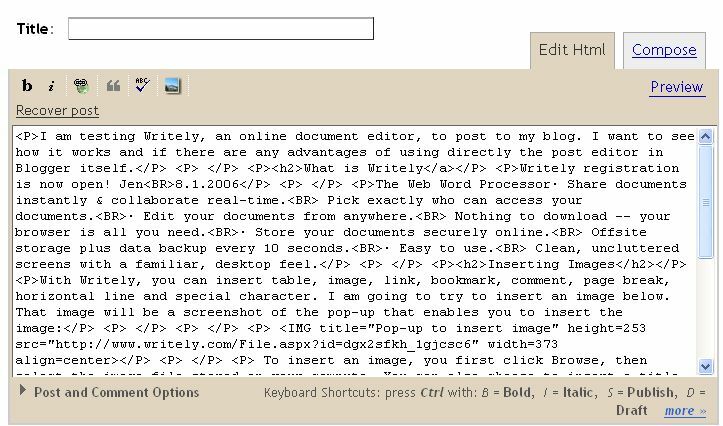 Which part of your blog it will appear will depend on where you paste the code. For a guide to this, refer to Blogger template tutorial - adding content via the template. You have a up to 8 choices of what type of button you want. Note: this will work well if the person you want to ban have a fixed IP address. However, if he has a dynamic IP address, this may not work so well. Also, I tested it using Blogger Beta. Testing IP banning in Blogger Beta. Actually, it is just a redirect. After adding the script, when I tried to get into my blog, I saw it momentarily, and then was redirected to another site (which shows that it works). to prevent the use of the cache to read whatever got loaded before the redirection take place. I have not tested this yet. Rose said in the comments section that you can't ban AOL users using this method. I would have loved to test that and to update this post, but I don't get many people I want to ban from my blogs, and also not that many visitors from AOL. If anyone have experience with that, I hope you will put your experience in the comments section. UPDATE 24 December 2006: Toolshell IP Check and IP Ban site is online again. You can now ban up to 5 IP addresses and can choose the site you want the banned person to be redirected to. So the method described below will work again. UPDATE 23 October 2006: Toolshell IP Check and IP Ban site is no longer accessible. Why, I don't know. However, if you are desperate, you can read through the post, click on the link and see if the site is online again. Update 5 October 2007: Toolshell IP Ban is online again, but this time you will have to go to Toolator IP Ban, plus now you can ban up to 10 IP addresses. Someone asked if he can ban more, and I suggested perhaps try adding more than 1 scripts, and the feedback I got seem positive. LATEST: Toolshell or Toolator or whatever keeps changing and I have given up trying to keep up to date. If you need more information, go to their contact form.